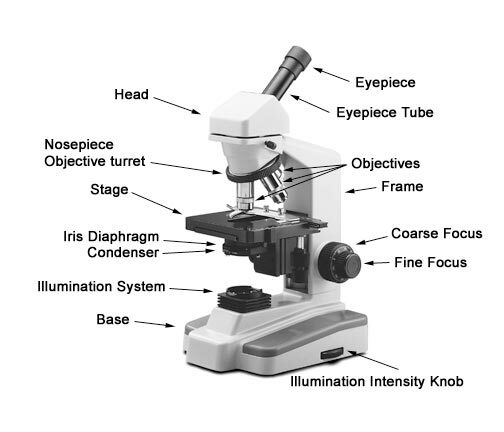 Below you can see a typical monocular compound microscope with the important parts labeled. Please hover your mouse over the labels to get more information. Eyepiece Also known as the Ocular, you look through this to view your target. It has a lens which commonly has a power of 10X. Some microscopes have interchangeable eyepieces with varying magnification power. Eyepiece Tube This is the hollow tube that connects the eyepiece to the lower set of lenses (the objectives). Objectives These lower lenses are attached to the nosepiece and are closest to the specimen. Most compound microscopes have 3-5 lenses of varying magnification. You swivel the desired lens into place depending on how much magnification you need. Frame The structure which supports the upper microscope components. This should be metal for durability. Coarse Focus Turning this knob brings the target into focus. The coarse knob moves the focus faster than the fine knob, so it is used to get the focus close before switching to the fine focus. Fine Focus After using the coarse knob to get the image in focus, you then use the fine focus knob to make it as sharp and clear as possible. "Coaxial" focus knobs (as shown in this illustration) have the fine focus knob inside the coarse focus knob. This is more convenient than if they are separate because you do not have to move your hand when switching from one to the other. Illumination Intensity Knob Used to adjust the intensity of the light. Some light systems, such as fluorescent, do not have intensity adjustments. Base The structure that support the microscope and is where the illumination system and other electronics may be located. Illumination System This is the feature that illuminates your target. There are different styles such as halogen, fluorescent, tungsten, L.E.D and mirrors. Iris Diaphragm The diaphragm adjusts the diameter, and therefore the amount of light projecting from the condenser onto the target. Condenser The condenser uses a lens system to focus light from below the stage onto the bottom of the specimen. Stage This is where you place the specimen you wish to view (target). A Mechanical Stage such as shown in this illustration uses knobs to move the stage in the X and Y directions, thereby making it much easier to view different parts of the specimen. Nosepiece Objective Turret This is where the objective lenses are attached. The piece that rotates the lenses around the nosepiece is called the turret. Head This is where the eyepiece tubes are mounted and contains the optics to redirect the image from the objective lenses to the eyepieces (a.k.a. oculars). Often the head can be rotated 360 degrees to allow convenient viewing from any angle.